We’re celebrating the National Youth Savings Challenge in April and National Credit Union Youth Week from April 20 – 26! The National Youth Saving Challenge, sponsored by GreenPath Debt Solutions, is held during April in conjunction with National Credit Union Youth Week. It’s hosted by the Credit Union National Association (CUNA). The goal is to start youth on the right path of setting goals and saving to reach them. All month, each time a deposit of $5.00 or more is made into a Kids 1st or iMember account, the youth member will be entered into a random drawing for four Hersheypark tickets! 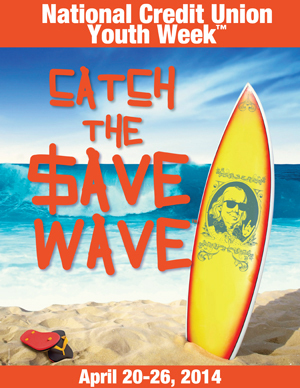 In addition, we’ll be celebrating and helping our youth members “Catch the Save Wave” so they understand the importance of saving, managing money and having a positive relationship with their credit union. National Credit Union Youth Week runs from April 20 – 26. Make sure to stop by your local branch to deposit funds into your favorite youth member’s account starting tomorrow! April is also the perfect time to open an account for your favorite young person so they can start saving and be entered to win!